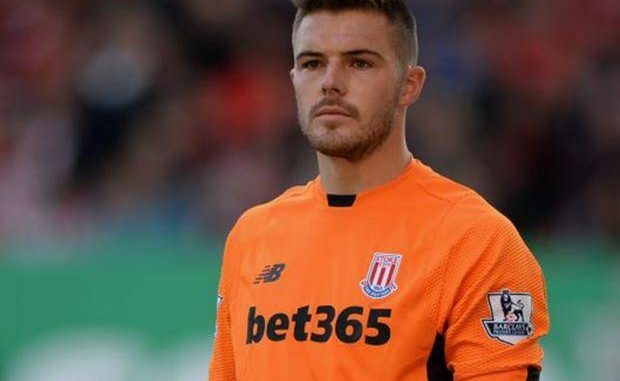 Liverpool FC could plot a late bid to sign Stoke City ‘keeper Jack Butland in the summer transfer market, according to Sky Sports UK journalist Dharmesh Sheth. The Reds have been connected with a move to sign a shot-stopper frequently over the past 12 months. Both Loris Karius and Simon Mignolet have failed to prove that they are the long-term solution in goal for the Merseyside club. The German shot-stopper Loris Karius made two mistakes in a 3-1 defeat against Spanish giants Real Madrid in the Champions League final. Liverpool FC have been connected with a move to land Serie A giants AS Roma’s Brazilian Alisson Becker in recent months. The Reds could also target the English club Stoke City ‘keeper Jack Butland following the Potters’ relegation to the EFL Championship. Sky Sports News reporter Sheth suggested that the Reds could submit a last-gasp offer to land the England international. “I think there will be something late in the window with Jack Butland. Whether it could be Liverpool or another club.” Sheth told the Transfer Talk podcast.